Just about 100 people lined up to see if this smartwatch is worth their time, much much less than people who turned-up to get the iPhone 6. The Apple Watch will be available for try-on in eight countries today and the shipments are scheduled to start on April 24th. You can start placing your order for the Apple Watch at Friday 3:01AM in New York. Apple even recommends you make an appointment on their website before you visit the store for a try-on, hopefully that won’t be necessary if response is similar to Sydney. You also need to keep in mind that Apple currently accepts only online orders and will eventually make it available in their stores. Apple Watch will be available in the price range of $349 to $17000! Apple Watch being a new product and a whole new market segment the response is expected to low, but Apple on the other hand is expecting a massive response so much so they expect you to make an appointment online before you visit their store to try-on the Apple Watch. Hopefully, that won’t be necessary. 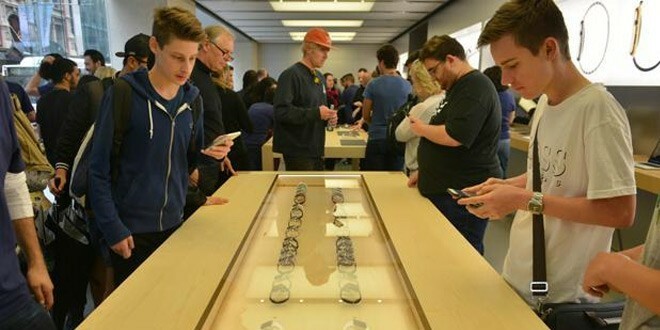 “Based on the tremendous interest from people visiting our stores, as well as the number of customers who have gone to the Apple Online Store to mark their favorite Apple Watch ahead of availability, we expect that strong customer demand will exceed our supply at launch,” Angela Ahrendts, Apple’s retail chief, said in a statement on Thursday. Once the product goes on sale and the numbers come in we will know for sure how people really perceive the Apple Watch. Will Apple Watch make it? Previous: Mom of 6 Boys Reacts When She Learns She is Having a Girl!